Abraham Lincoln: the president paid a substitute to enlist in the Union Army. Many healthy men who were eligible to serve in the military during the Civil War never ended up enlisting. The Enrollment Act of 1863 provided that a draftee could pay a “substitute” enrollee the sum of $300 (about $5,000 in today’s terms) in order to enlist in his place. Such famous Americans as Grover Cleveland and John D. Rockefeller took advantage of this provision, in effect buying their way out of service. Abraham Lincoln was too old for the draft, and, being president, would have been exempt regardless of age. But the Army was short of men, and the commander in chief wanted to encourage other “ineligibles” like himself to voluntarily hire a substitute. To that end, in 1864 he paid a “representative recruit” to fight for him. 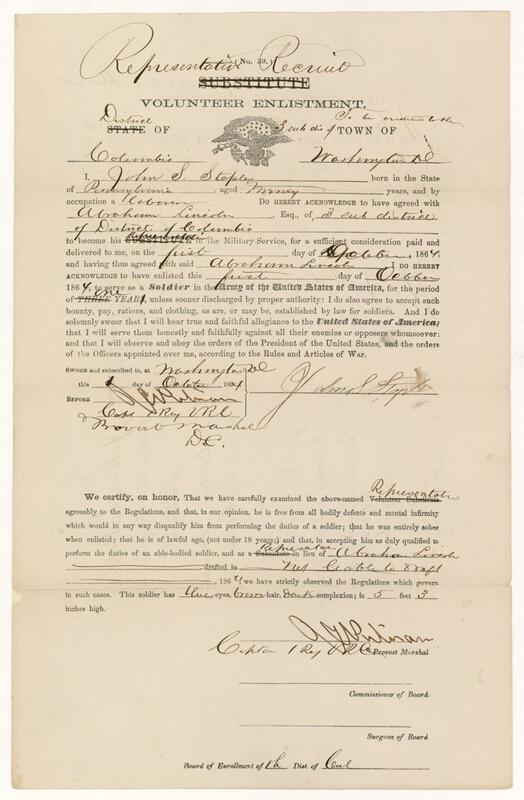 This document, held in the National Archives, records the enlistment of 19-year-old Pennsylvanian J. Summerfield Staples at Lincoln’s request. Staples, who had served as another man’s substitute earlier in the war, was a laborer who happened into his new gig when walking down Pennsylvania Avenue. The president had deputized Washingtonian Noble D. Larner, who was a member of the draft committee of his ward, to find a suitable recruit. Larner bumped into Staples on the street. After Staples said he might be interested in the job, Larner took him to the White House. There, Lincoln approved of Larner’s choice, told Staples he hoped he’d be “one of the fortunate ones,” and paid him $500. An official swore that Staples was of age, “free from all bodily defects and mental infirmity,” and “was entirely sober when enlisted.” The official recorded that the substitute had blue eyes and brown hair and was 5 feet 3 inches tall. Staples went on to have a relatively easy time of it in the Army; he served for only a year and worked as a clerk and a guard. His later life was less lucky. He suffered from poor health, and although he applied for a Civil War pension in 1882—claiming to be disabled following the typhoid fever he suffered during his first enrollment—his application was denied. Staples died of a heart attack in 1888 at the age of 43.